PEC will provide financial coaching, employment training and placement, and public benefits access through LISC’s one-stop-shop service model. PHILADELPHIA, PA – January 23, 2014 – West Philadelphia residents will have access to comprehensive career and financial services in their own neighborhood with the launch of a new Financial Opportunity Center (FOC) by the People’s Emergency Center (PEC), in partnership with Philadelphia LISC. The addition of the FOC will expand services currently offered through PEC’s Center for Employment and Training, which provides area residents with access to job readiness and placement programs. The FOC will focus on improving the financial bottom line for low-to-moderate individuals and their families through the integration of LISC’s comprehensive service model that includes financial education and coaching, employment training and placement, and access to public benefits. 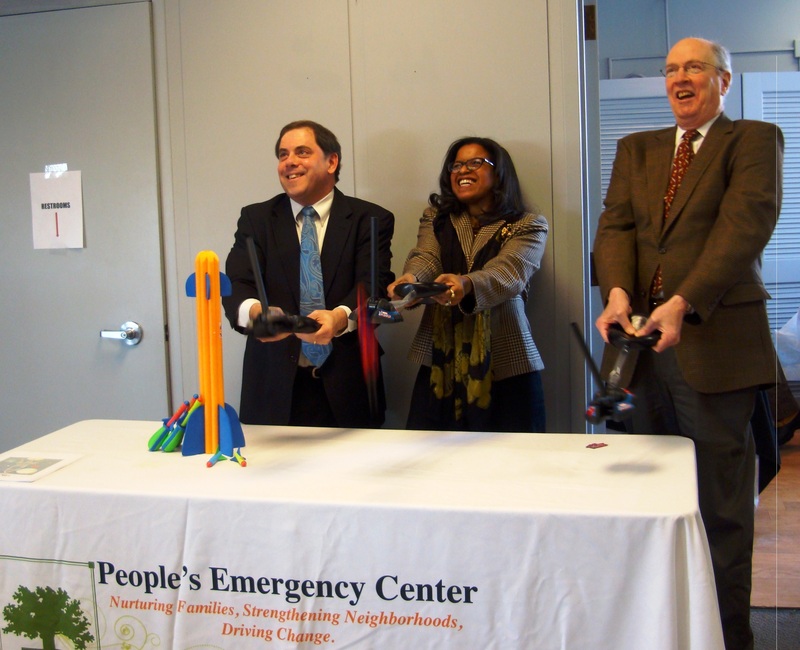 Pictured: PEC President and CEO Farah Jimenez; Philadelphia LISC Executive Director Andrew Frishkoff; Don Haskin from Citi Foundation at the “rocket launch” of PEC’s Financial Opportunity Center. “Our formerly homeless residents face several barriers when entering or reentering the workforce, and many families in our neighborhood are one missed pay check away from losing their homes. We are thrilled to partner with Philadelphia LISC to provide this innovative model to our neighborhood and support residents in creating brighter financial futures for themselves and their families,” said Farah Jimenez, PEC President and CEO. Pioneered by LISC, this one-stop-shop service approach is implemented across 70 centers nationwide, including two others in Philadelphia, operated by the University City District and the Asociación de Puertorriqueños en Marcha (APM). In Philadelphia, the FOCs are made possible thanks to funding from Citi Foundation, State Farm, Walmart Foundation, and the William Penn Foundation. AmeriCorps APM Civic Association Community Safety Evaluation financial opportunity center Green Block Build LISC Mantua Quality of Life Planning Rainbow de Colores Report Card Resident Engagement SCI Eastern North SCI West We Are Mantua!